Specs: These bandpass filters are tight, narrow bandwidth HF Filters. The 3 dB bandwidth is about 90 KHz @ 7 MHz. The 6 dB bandwidth is about 140 KHz @ 7 MHz. Each BPF Kit is FOR ONE BAND ONLY. 1. Install C2, C4 and C7. a. Install trimmer capacitors into their correct places per the above PCB layout. Install with flat side of trimmer into square hole pad. d. Install and solder toroid inductor L2. 3. Install L1 and L3. a. Review this example of a dual winding toroid for 30 meters. 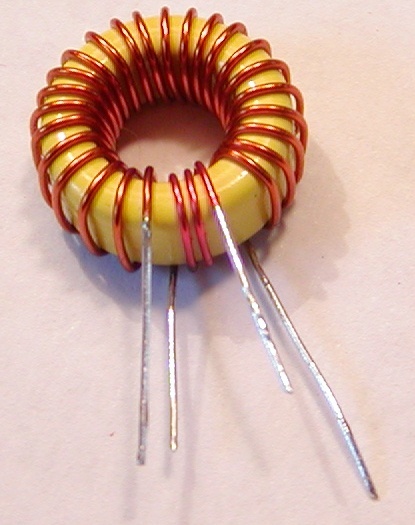 d. Install and solder toroid inductor L1 and L3. 4. Install C1, C5 and C8. 5. Install C3 and C6. 6. Connect the BPF via J1 and J2.